I love my weekends at home. Which I know some of you will find hard to believe, given the number of weekends I spend away from home in some exotic foreign land! But the truth is, I get very excited about the prospect of a weekend at home. I love the fact that I have no deadlines to keep and can sleep till I wake up without the aid of the alarm clock. I love the smell of Nick making coffee wafting up from the kitchen (on weekdays I have herbal tea). I love spending a day with no make-up on. I love having time to bake AND being able to photograph what I made in natural light. I love sitting with my laptop by the garden door, looking out at my extravagantly coloured tulips. 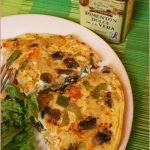 And I love the fact that there are all kinds of food that we only really eat on weekends – pizza on a Friday night; croissants for breakfast; corn on the cob slathered in butter; and fun DIY meals like fajitas or filled pita breads. The only rule, really, is that nothing should be too complicated or time-consuming – I mean, we wouldn’t want to waste valuable relaxation time, now would we?? So there I was this weekend, lunchtime approaching, assuming my usual position when I have nothing specific on the menu, i.e. standing with the fridge door open and peering into it as if all the secrets of the universe will be revealed if only I stare intently for long enough. There were various bits and pieces floating about – some bell peppers and zucchini that needed eating and some tortilla wraps. Which reminds me – why do they always come in pack sizes that are not quite right for two people? Even if Nick can plough his way through 3 fajitas, there is no way I can, so there are always a couple left, and once the packet is open it’s only a day until they are dry and unusably hard. So after some of the aforementioned intent staring, I came up with a plan that would use up both the peppers and the leftover tortillas: quesadillas! Now I’m sure there are many fine and authentic Mexican recipes for quesadillas, but speaking as someone who first discovered them when they appeared on the menu at the Spur (a South African franchise of child-friendly steak restaurants) together with a handy pronounciation guide (who knew you don’t pronounce those pesky Ls! ), I don’t pretend to have any knowledge of the traditional version. These are simply me take on the theme of a toasted tortilla sandwich, and I have to say they were super-easy and delicious. The tortillas contained flax seeds which gave them a particularly delicious nutty flavour, but any flour tortilla will work. And you can be as creative as you like with the filling – just remember not to overfill them, and use enough cheese to keep everything together. Heat a couple of tablespoons of oil in a heavy-based frying pan. Add the onion, garlic and peppers and saute over low heat until the onion is translucent. Add the peppers and zucchini and continue to cook until they are soft. Season to taste. Heat a splash of oil in a non-stick pan with a diameter at least as large as the tortillas. Place one of the tortillas in the pan and sprinkle a little grated cheese over it. Then spoon half the onion and pepper mix over the cheese and spread evenly. 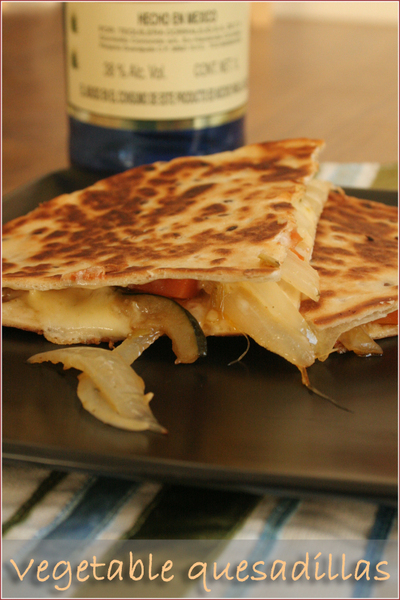 Finish with another sprinkling of cheese and place a second tortilla on top, making a sandwich. Using a large egg lifter, press down on the top tortilla and keep cooking until the base is beginning to brown. When you are sure that the cheese has melted sufficiently to glue the two tortillas together, then carefully slide the egg lifter underneath the bottom tortilla and flip the quesadilla over. Cook until the base layer begins to brown. 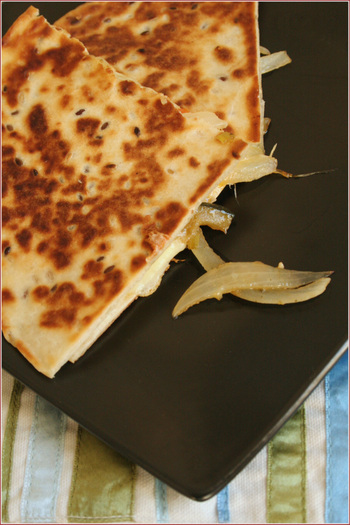 Remove the quesadilla from the pan and place on a warmed plate in a very low oven or in a warming drawer. Repeat with the remaining ingredients to make a second quesadilla. Slice into quarters and serve immediately, preferably with a green salad. A shot of tequila is optional! 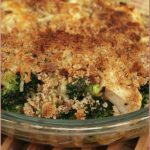 I’m submitting this post as my entry to this week’s Weekend Herb Blogging, kindly hosted by Susan at The Well-Seasoned Cook. Thank you for sharing your perfect, simple weekend lunch w/ WHB! I couldn’t agree more about the joys of being at home. I think that’s partly why I like being a teacher: summers are like one big long weekend. This is just the sort of thing I’d like to cook on the weekend too, sounds delicious! I’d say your quesadillas in the photo are just perfectly browned! Yum – that’s one of my favorite meals, definitely! isn’t it interesting that i am completely the opposite? quesadillas and quickly thrown together meals are more likely to appear on our menu on a weeknight, whereas i take the opportunity on a saturday or sunday to park the kids with chris, do some serious food shopping (it’s not quite the same experience when you have a 4 and a 1-year-old in tow) and take a whole afternoon cooking for a multi-course meal in the evening. 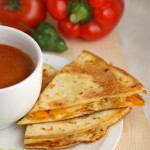 everybody here loves quesadillas, though, and i like them even more as sincronizadas, popular dinner in my mexican host family: stuffed with cheese and brunswick ham, lots of salsa on the side… mmmh! We usually get corn tortillas, separate them, repackage and then freeze them. This way, there aren’t dried out tortillas languishing in the fridge after the package has been opened. I think I may need to get a couple of tortillas out of the freezer to try this! When I was still living alone, I used to make fake pizzas out of tortillas – using the tortillas instead of pizza dough. It works fabulously. Salut Leigh, comment ai-je lire ce post. J’aime votre colis de Scarlatti et les cartes de sa belle enfants si mignons. Bentley est un singe fou! votre vélo rose regarde roman. aimez-vous Barbie rose par hasard starange? avoir du plaisir à la piloter. I love those recipes where you just throw what you find in the fridge and come up with a great meal. I always make to many fajitas just to get rid of the tortillas, now I dont have to I can save some them for this. Cheers for a great recipe.